Emmy Mom--One Day at a Time: Game Day! It is a big one..
ESPN Game Day is even going to be on location in Provo. 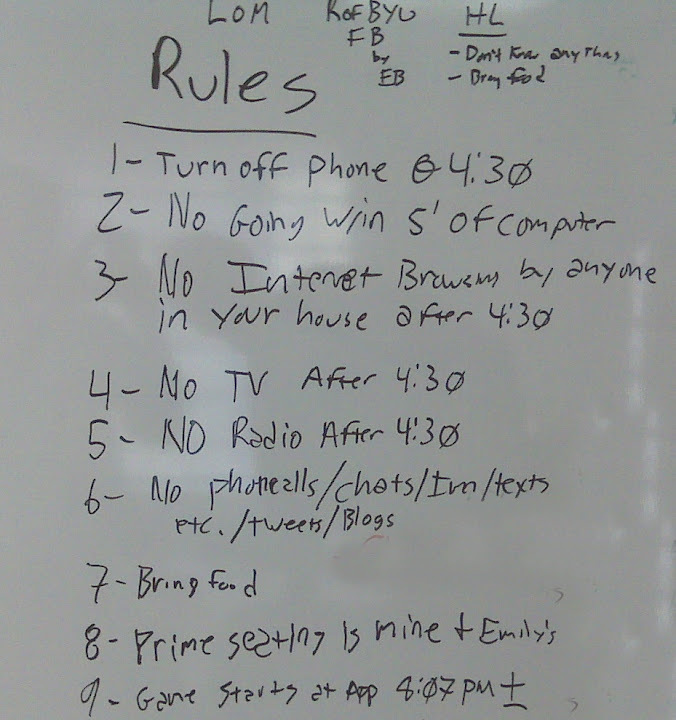 And with Game Day comes some rules in our house. You see, we always watch the game after the kids are in bed, as I want to actually watch the game and not be dealing with the kids. The game starts at 4:30, but we will not watch it until about 8:00, that means a few rules must be followed. This was written by my husband at work, one of his coworkers wants to join us watching the game. He has a few rules he has to follow if he wants to come watch with us. Yes, for good or bad we are this serious. We want our viewing experience to be as if we were watching the game live.. it just doesn't have the same intensity if you already know the outcome and we don't want any accidental stumbling on the results. Just think of it like this. Say you love Dancing With the Stars; imagine if someone somehow knew who was going to win and told you during the first week. It just takes out the excitement, the wonder, the suspense. Or when the Twilight Series was coming out, if someone told you the ending when you were just starting the book. Yep, it feels that bad. So we take all precautions necessary. Thanks everyone for voting on the poll so far.. keep those votes coming. And remember please vote on how old you think I LOOK. Wow, those are some pretty intense rules. I do understand watching after the kids are in bed. Its just that much easier. I am really excited for the game. Go BYU! GO COUGS!!! so sad i had to miss game day this morning:-( i really thought i would be home in time. wasn't expecting to wait 4 hours at the health dept!!! so worth it though:-) wishing i would have told sean to tape it. said it was really fun. and that i would dislike lee corso even more than i already do. not sure if that is possible, lol. Last season of 24, I got wind of some intel concerning a much beloved character. Let's just say it wasn't good. I was not happy. I chastised the person in the group for spilling the beans. From that point on, I stayed away from emails that were related to that show until after I had seen the most recent episode. So yeah, I get it! Have fun. That list is intense. Go Cougs! I feel your pain sister. In our house, football is serious stuff. It begins on Friday when our oldest plays high school ball, continues on Saturday so they can watch the Horns, then is a Sunday long marathon while they watch every game so they can keep track of their fantasy team scores.